Thachanadan Moopan is a Scheduled Tribe in Wayanad district of Kerala State. According to Kerala Institute for Local Administration (2008) there are 1649 people living in Meppadi, Ambalavayal, Kalpparra, Muuttil, Kadachikullu, Kottanad, Rippon, Kadooru, Puttyad, Vythiri and Kallumala areas of Wayanad District. 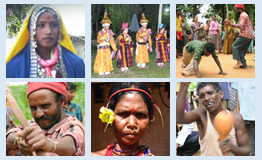 This tribal community is also found in the list of endangerment of tribal languages in Kerala. Language of Thachanadan Moopan is a combination of three languages namely, Malayalam, Telugu and Tulu. Their language has no script and is transmitted only orally. They use Malayalam language to communicate with others, while they use their traditional language within the community. However, only the elders are more conversant in their traditional language as it is gradually losing its grip from the younger generation. Earlier they worked under landlords as slaves and they got one seru paddy as coolie per day. This system is known as mallipani (malli means nellu) that is, paddy. Now-a-days they are mainly wage labourers in tea and coffee plantations. Other major occupations include Tribal Promoter, Teacher, Driver, Pastor, Clerk, Hostel Worker, Forest watcher etc. Religion is generally used to designate man’s relation to the supernatural powers and the various organized systems of belief and worship which relations are expressed. Religion emerges from the life experiences of the people and at the same time it influences the thought and behaviour of the people. Myths and legends had great importance in making their worldviews. Experiences of certain day to day sudden happening of disease, death and other then explainable phenomenon seemed to have led the tribal people into believing in other than the materiel world, that is, in the invisible spirit world or supernatural power. The whole picture of tribal religion is formed form the idea of sacred complex, sacred beliefs, sacred performances, sacred specialists and sacred geography. They have two type of performance, “Kolkali” and “Vattakkali”. In these, performances will be happen in the happiest occasions not in the sad or death situations. In these performances Male and female will join, sometimes only the males or females will do. There is no other source for review, because no work has been done on this community, so the present work concerns about making of a trilingual dictionary, grammar and an ethno linguistic report of the language which is in progress.